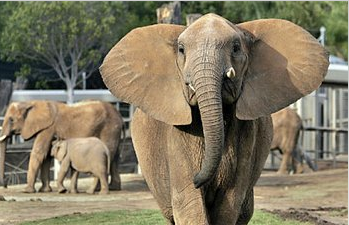 According to A San Diego newspaper, Elephants at the San Diego Zoo and Wild Animal Park have lost a combined total of 11,314 pounds ever since zookeepers began a nutrition and exercise program for them in 2000. The article points out "that's nearly 5.7 tons among seven animals. " Apparently, zoo keepers started to feed the elephants a number of smaller meals throughout the day, instead of three big meals. They also hid the food so that the animals would "work for it" and trained the animals to walk laps. And they cut out the elephants snacks, including jellybeans. Mary, one of the Wild Animal Park's Asian elephants, lost weight but couldn't keep it off. Zookeepers didn't understand – until they discovered Mary was stealing food from her pachyderm pals. Nature is cruel, it seems, even to elephants. The other pachyderms at the Wild Animal Park probably hate the aptly named Cha Cha. Like a supermodel, her trouble is keeping the weight on. Zookeepers also changed the main ingredient of their elephant pellets to soy. At the Wild Animal Park, the elephants do the equivalent of line drills in basketball. They've been trained to walk from Point A to Point B across the 3-acre enclosure, then back again. For an added element of difficulty, zoo workers rake the packed soil so it requires more effort to walk. It's like running in the soft sand at the beach instead of at the waterline.